When it comes to residential lighting, most people think of indoor fixtures such as sconces, chandeliers, floor lamps, and so on. Spending the time to plan for the best use of these elements in your home can mean the difference between a beautifully lit space and one that leaves a lot to be desired. However, it’s the outdoor lighting on your home that can truly illuminate your place with quality. If you’re a Nebraska homeowner in need of home lighting fixtures and expert advice, our lighting store in Omaha is here to help! The Light Palace was started in 1953 with a goal that still holds true today — delivering the best customer service. We strive to provide the best solutions for every aspect of your home. Today, we’ll continue to highlight the importance of illuminating your outdoor space by discussing a few more outdoor lighting tips. If you’re inspired to get to work, be sure to shop our expansive lighting showroom first! Entryways. The foyer to your abode demands proper lighting. This section needs to be lit properly at night to allow for safe sentry into your home while also increasing security. Wall lights on either side or an overhead above the door can produce amazing results. Paths. From the concrete sidewalk leading to your front entry to the garden walkways winding through your oasis, it’s important to properly illuminate any areas designed for travel. It is important to provide enough illumination for safe passage while avoiding too much light. We recommend spacing out your pathway lights and alternating them on each side for the best outcome. Decks. 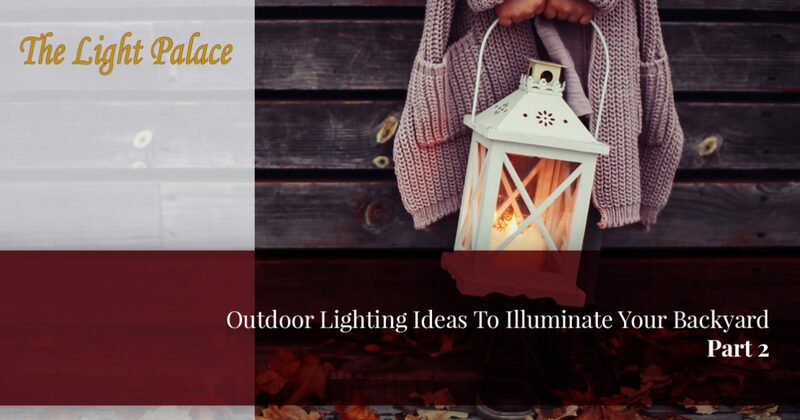 The patio or deck on your Nebraska home can be outfitted with modern lighting fixtures to provide both illumination for activities and to create a dynamic visual on your property. Be sure to plan appropriately for cooking, entertaining, and any other activities you plan on doing this summer. A wide range of lighting options can be utilized here. Steps. Remember those stairs we mentioned in the last blog? Placing lights along the sides or along your risers can produce amazing results. Landscape elements. Quality lighting can be used to create depth and drama outside your home, highlighting a wall, tree, or any area that is worth spotlighting. Investing time in your outdoor lighting project can provide unique design benefits! Exterior structures. Trellises and gazebos are quality structures to have on your property, and they can also be illuminated to create more depth in your landscape. You can also utilize uplighting to truly enhance your space. Fences. While this area can vary widely based on your specific goals (i.e. entertainment or security), lighting your perimeter can help to encapsulate the yard in a warm, inviting glow. Posts are the perfect place to put lanterns, and string lights can help to create a cohesive lighting plan. One of the biggest challenges with modern outdoor lighting is finding the right balance of illumination that accounts for the lack of reflective surfaces available while also minimizing any glare that comes from overdoing it. Failing to properly execute your outdoor lighting plan can result in numerous issues, ranging from blinding passersby to skyrocketing your energy bill. One of the biggest problems with modern outdoor lighting is balancing it with the many light sources already available. Light pollution is a common issue, but it can be minimized by taking the proper steps when assembling our landscape lighting plan. Even subtle lights can create unwanted results if aimed in the wrong direction. Keep the direction of your lights in mind when installing them. Remember to come out the night after you place your lighting fixtures to check on the results. A spotlight on your tree can look great, but keep in mind that more acute angles can blind the neighbors! Without daylight, the path of your beams can travel a long way. It is important to invest your time and energy into responsible installation procedures. If you’re unsure how to create the best outcome for your yard, a number of fixtures and add-ons have been made to offer more light control. Shields and reflective elements are useful for deflecting lighting away from people in a cost-effective manner. Finding the right lumens versus wattage can be a challenge, but keep in mind that low-watt fixtures and bulbs often produce a much more comfortable outcome at night. Lower wattages give you a softer glow that feels more natural, minimizing artificial lights that strain the eyes. In many cases, overdoing your lighting by just a small percentage can result in dramatic consequences. We recommend planning ahead, and if you’re in need, our lighting store in Omaha can help! Modern technology gives you the power to better control the lights around your home. This can be helpful for setting the right mood for guests in addition to increasing your lighting efficiency and decreasing subsequent energy bills. Timers, for example, allow you to take control over when your lights turn on. This can minimize any lights coming on early or staying on late. Zones can be used to provide additional control for homeowners who want to balance their plans. Worried about the amount of light? Outdoor dimmer switches can let you set the level to match your varying needs. When you have the ability to fully customize your outdoor lighting scheme, the results can be amazing! The Light Palace is here to provide comprehensive support for Nebraska homeowners. For more than 60 years, our team has worked to set a high standard in the industry, delivering guidance to go with all of our quality products. If you’re planning on illuminating your outdoors with pride this summer, be sure to stop by our lighting showroom in Omaha or contact us to begin!